Top view of the bright red junior rover – Rent this knee scooters in Denver! The Knee Scooter Store in Denver offers Colorado’s best selection of knee scooters. We have 5 different model options, helping us find the ideal choice for every customer. 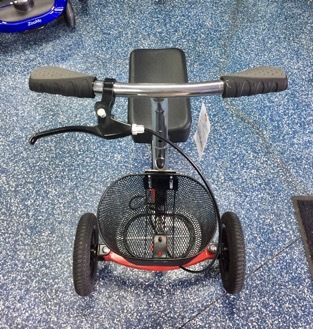 Many customers who know they’ll be injured or recovering from surgery for a couple of months think they will be better off buying a knee scooter. But then they buy the cheapest knee scooter from Walmart and find that it’s an uncomfortable experience. Don’t go cheap when seeking easy mobility during your recovery period. Spend a few extra bucks renting a high-quality knee scooter. Many cheap scooters have small plastic wheels, which can be a problem when you’re facing cold rain or snow. 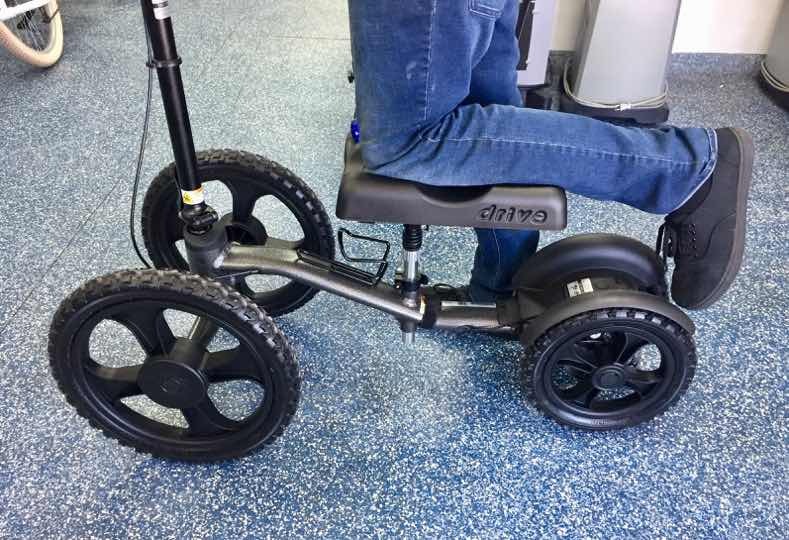 We offer all-terrain knee scooters rentals with real pump-up rubber wheels and tread. Many customers come to see us with much longer recovery time than they expected. They think they can survive for a couple of weeks on crutches. But then they have a hard time keeping off their injured leg, ankle, or foot and it doesn’t heal correctly. Renting a knee scooter gives them the mobility they need, providing the support their leg needs while allowing them to rest and heal quickly. Whether you’re recovering for a couple of weeks or a few months, we believe that it’s worth the extra-cost renting a high-quality knee scooter here in Denver. Husband just tore Achilles. need knee scooter to rent, cost? Anywhere between $65 and $195, depending on the model. The best one is the All-Terrain, which is $125. Normally they’re $195 but we give everyone a discount. Give us a call and schedule a time to visit us and we’ll find the right model for your husband’s height, weight, and the road conditions he’ll encounter.